Transylvania - The Vegetable Garden at Miklosvar Oils on Canvas 51 x 61cm 20 x 24ins. 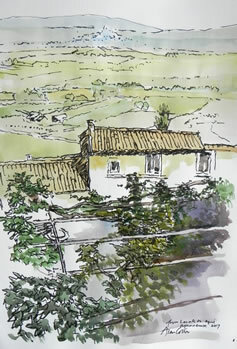 Two summers ago Alan Cotton travelled to Transylvania to gather new ideas for his paintings. For many it is a land of legend and mystery, but for Alan it was an amazing discovery of a landscape and way of life largely unchanged for centuries. The wildflower meadows, hayricks and village cultivation provided rich material for a series of paintings of this pastoral landscape. For this studio exhibition he has produced a collection of new Transylvanian paintings together with work from Provence, Venice, Piemonte and Hartland in North Devon. The exhibition is open for two days only, when the artist will be there to welcome anyone who would like to visit the studio and see his work. The art auction is to raise funds for Honiton's Admiral Nurse Campaign and the THG Learning Programme supporting those with dementia and other mental health issues. Alan, who is its Patron, has donated this painting for the forthcoming auction. The Exhibition is in aid of The Maynard School and their partner charity Young Minds. Alan will be opening the exhibition at a Private View on Thursday 15th March and will be exhibiting these two paintings. Alan was invited by his friend Ken Howard, to donate paintings for the Charity Kids for Kids for an exhibition and Auction - "Ken Howard and Friends" This is a charity which loans a family six goats, which provides milk, butter cheese and from which they breed and pass on goats to other families. Auction. Thursday 26th October 2017, 6.30 for 7.00 p.m. Entry is by tickets which are free but limited. To apply for tickets email contact@kidsforkids.org.uk or call 07957206440. Private Views. Thursday 19th October & Tuesday 24th October 2017 from 6.30 p.m.
Alan is a Patron of the Art4Macmillan Fund Raising Event and together with other artists and sculptors, has donated a painting to the Art 4 Macmillan Auction. This will be a sparkling event at Rockbeare Manor near Exeter with a drinks reception, canapés and elegant dining in the ballroom, where the auction will take place. The work will also be on view at St. Stephen's Church in the centre of Exeter (next to House of Frazer), on Friday 29th and Saturday 30th September. All the works in the auction will be exhibited there, together with other works which can be bought at the public viewing. For those who cannot make the dinner and auction at Rockbeare Manor on 4th October, sealed bids, to be included in the auction, can be left at St Stephens during the public viewing. 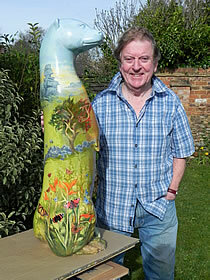 Alan has been involved in the Moor Otter project since last year, when the organiser, Dave Southern, invited him to select twenty professional artists to join him in painting a 3ft high resin otter, in any design of their choice. These will be auctioned at the end of September to raise money for the conservation 0f Dartmoor National Park. These otters, together with those of other artists, who submitted designs, will make up a 100 otters to be exhibited all around Dartmoor throughout the summer months. Whilst some artists have chosen to paint in their own individual styles, others have gone for the comic element, with Sherlock Holmes, Harry Potter, D’Arth Vada, Batman and even a bespectacled nun, making their appearance in venues around the moor. A booklet is being produced, with illustrations and a map, so that families or school groups can explore Dartmoor by going on an otter hunt. They can vote for their favourites and even post coins in their money boxes. Alan chose “An Otter for All Seasons” (with apologies to Robert Bolt) and as you walk around the Otter he reveals some of the delights of Dartmoor throughout the four seasons of the year. Alan says that this is definitely a ‘one off’ - the only 3D Alan Cotton painting ever to be produced - a collector's item indeed! 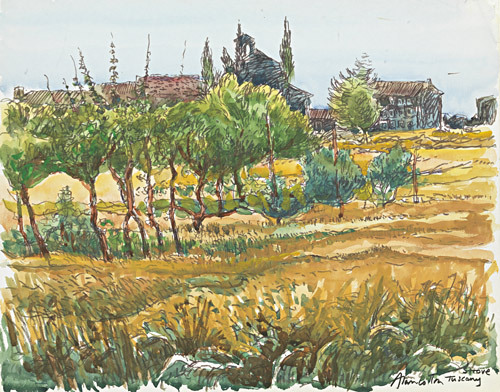 During his travels around the world as a working painter Alan has accumulated many books full of drawings, watercolours and pastels. These are the source material for all the oil paintings, most of which are completed back in his Devon studio. As he regards these as a series of personal memories, he has held on to them. With plans for a new book being launched next year in London, however, he and his dealer, David Messum, felt that exhibiting a collection of works on paper, along side some of the oil paintings would make an interesting exhibition, where people could see the gestation of the ideas in relation to the completed paintings in oils. In this show there are 78 pieces of work from locations as diverse as Venice, Piemonte, Provence, Tuscany, Isle of Skye, Hartland and the West Coast of Ireland. The Arts and Sculpture Exhibition takes place annually, every Day throughout May, at Delamore House and Gardens. It presents the largest collection of artists' work in one place in the South West. The extensive gardens feature ancient Rhododendrons and Azaleas, at their best in May, creating a vibrant and exciting backdrop to the finest Sculpture exhibition in Devon. 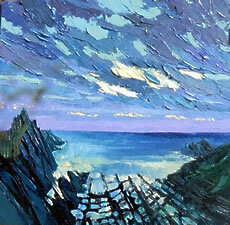 There is also an exhibition by the Academicians of the South West Academy, in The Stable Gallery in the grounds. 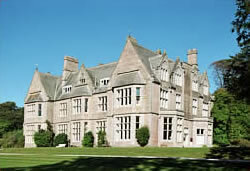 Based at Cornwood near Ivybrige, Delamore is right on the edge of beautiful Dartmoor and makes for a fantastic day out. As part of the 2017 Delamore Arts Season, Alan will be in conversation with his biographer, the Art Historian, Jenny Pery about his many travels, with humorous stories and some hair-raising experiences. His talk will include journeys he has made as Tour Artist with His Royal Highness, The Prince of Wales, as Expedition Artist to Mount Everest, with explorer and adventurer David Hempleman Evans, and his most recent trips to Transylvania and to Provence, where he met with his friend, the Lacoste Poet - a fascinating Irishman, who allowed him to work in the garden of playwright Sir Tom Stoppard. Visit Delamore this coming Sunday for Alan's conversation with Jenny on stage at 3pm. Earlier enjoy the exhibition of paintings and sculpture in Delamore House and explore the wide range of sculptures in the beautiful gardens, including 20 otters painted by well known artists, which together with 80 others will be exhibited around Dartmoor throughout the summer. After a gap of three years Alan is delighted once again to be opening his doors for a studio Exhibition at his home in Colaton Raleigh. After spending a long period working alone in his studio Alan says "it will be a joy to welcome everyone along to share my latest paintings whilst enjoying a pre-Christmas drink". Following the terrific success of his London exhibition in the West End in September and October, this studio show features paintings from his recent travels to Transylvania along with work from the rugged mountains and swirling clouds of the Isle of Skye, the hill towns of Provence and Piemonte, the reflections in the canals of Venice and the wild coastline of Hartland in North Devon. Transylvania is for many a land of legend and mystery, but for Alan it was an amazing discovery of an idyllic lifestyle unchanged for centuries. 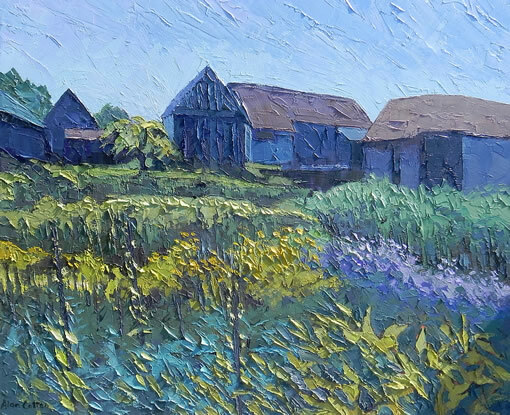 Alan was enthralled by the vibrancy of the wildflower meadows and has captured the hayricks and traditional farm buildings in his paintings. In addition to the paintings there will also be 15 Limited Edition Prints only obtainable from the Artist's studio and the two biographies by Art Historian Jenny Pery, as well as catalogues from previous London Exhibitions. As part of the Appledore Book Festival Alan will be in conversation with Judi Spiers, the well known broadcaster and writer. He will be talking about his two biographies, by Art Historian Jenny Pery "On a Knife Edge" and "Giving Life a Shape", both published by Halsgrove. Alan will also reveal his plans for a new book of his drawings to be published in 2017 and the audience will have a chance to preview some of them. Judi will also be asking Alan why he chose to travel to Transylvania in June 2016 and of his experiences in a landscape which is how England would have been before the industrial Revolution. 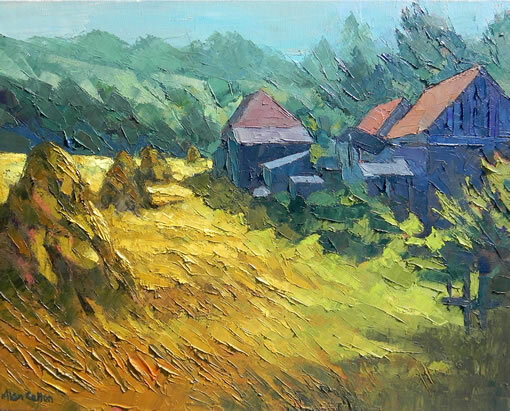 He has long been interested in painting in this part of Romania and has followed the radio and television broadcasts by HRH The Prince of Wales, who has an interest in the sustainable farming methods of this region. Alan is quite excited by the prospect of working there. By the time the Appledore Book Festival takes place Alan will have spent the summer months in Transylvania and the audience may well see some of the resulting paintings. As well as a fascinating insight in to Alan's life and work, there will be a visual background to enhance his conversations with Judi. Alan Cotton's next London exhibition opens on Wednesday 14th September 2016 at Messum's new gallery at 28, Cork Street. Alan is currently working on paintings from his recent visits to the Isle of Skye and a series from the West Coast of Ireland. More recently Alan returned to Hartland and travelled along the coast to Welcome Mouth. The result is a completely new set of drawings of this wild coastal region of North Devon, from which paintings are developing for his London Exhibition. All the work for the London show needs to be ready for the catalogue by mid June, as Alan then plans to move to a completely new and for him, unknown landscape, when he will be travelling to Transylvania, complete with drawing books and watercolours. Although any work from there will not make the 2016 catalogue, Alan hopes that the very first of his Transylvanian paintings will be completed in time for this show. This Retrospective Exhibition spanning over 40 years of Alan's work opens at the Royal Albert Memorial Museum and Art Gallery in Exeter on 17th September and runs until 1st November. The paintings have been collated from public and private collections worldwide, including the Royal Collection and features paintings from his early days in the Wye and Otter Valleys, and Hartland to Venice, Provence, Piemonte, Ireland, Fiji, New Zealand and Everest. The Private View at the RAMM, is on the evening of 16th September when the exhibition will be officially opened by actor, John Nettles OBE. The preview and reception, which is by invitation only, is being sponsored by Bonham's Auction Houses and the exhibition supported by The Arts Council. There is a commemorative catalogue of the Retrospective "Contours in Colour", which has 68 paintings reproduced in colour and can be obtained from the RAMM shop. The text, commenting on each decade of the artist's work, is by Alan's biographer, Jenny Pery. The exhibitions will be supported by lectures and talks. This exhibition has travelled from "The Edge", the new Centre for the Arts at the University Bath, where it was opened by Prince Edward, Earl of Wessex at the end of June. Retrospective Exhibition: "Contours in Colour"
The University of Bath has just completed the building of a new Centre for the Arts, which will have a whole range of new arts facilities. The Centre has two theatres, music rooms, dance and drama studios, a restaurant and one large and two smaller galleries for contemporary art. In order to celebrate the opening of this new venture the university has invited Alan Cotton to have the first Summer Exhibition, which will show paintings from collections, spanning the decades since his days as an art student. John Struthers, the Director of ICIA, (Institute for Contemporary and Interdisciplinary Arts), who has been overseeing the project, said "Alan has been a huge support to the University of Bath in moving our ambitious arts project forward. He is an Honorary Professor of the University and has been involved in fundraising and advocacy for several years. It is fitting therefore that our first annual Summer Exhibition should be the first retrospective of his work." Contours in Colour will be shown at the University of Bath to be opened on the 30th June by the Earl of Wessex, Chancellor of Bath University and running until the 12th of September 2015. The exhibition will then have a second showing in Exeter at the Royal Albert Memorial Museum opening on the 17th September and running until the 1st November. There will be a commemorative catalogue, with a Foreword by Dame Professor Glynis Breakwell (Vice Chancellor), and the exhibitions will be supported by lectures and talks. 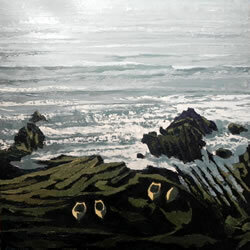 Alan's original plan for an exhibition of paintings of the West Coasts of Ireland and Scotland at Messum's Fine Art in London, was put on hold, when David Messum pointed out that this year marked the 30th Anniversary of their meeting and decided he would like Alan to re-visit all the areas he has painted during his many exhibitions with the Gallery. So Alan has been back to Piemonte, Venice, Provence, Ireland and Hartland in North Devon and searched out drawings for new work of Cyprus, Morocco, Tibet and Tuscany to produce a varied and exciting show of over fifty paintings from all of these countries. In the Spring of 2011 the Senate of the University of Bath conferred on Alan the position of Honorary Professor of Arts. Over the past four years he has had a developing relationship with the University of Bath advising on its new "Centre for the Arts" project, which is due to be completed in the late summer of 2014. 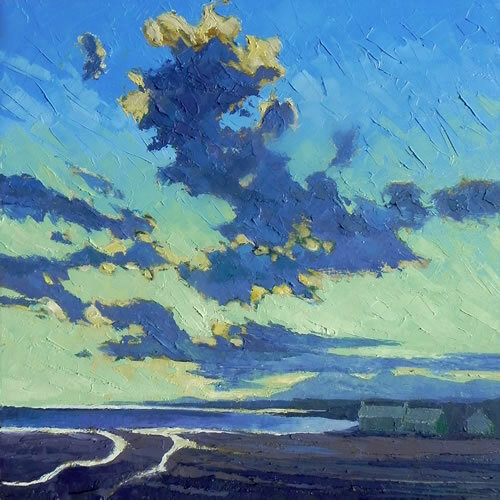 As part of his role in the University, Alan will be completing a series of paintings of Hartland, which will become part of the permanent collection. Over the years it has given Alan much pleasure to open his studio for a few days to welcome anyone interested in his work, to come along and see his latest paintings whilst enjoying a pre-Christmas drink. This exhibition includes paintings from his trip to Everest, where he was expedition artist with the explorer David Hempleman Adams, There will also be new works from Venice, Provence, Ireland and his first ever paintings from his recent trip to Istanbul. In the exhibition there will also be 12 Limited Edition Prints, only obtainable from the Artist's studio, including a new print, 'Tibet - Prayer Flags at Everest Base Camp'. For more information contact Alan through this website. A substantial number of paintings by South West Academicians and other established British Artists including Ken Howard RA OBE, Rose Hilton ARCA, Peter Brown NEAC, and Peter Randall-Page will be auctioned to raise money for the Children's Hospice South West. Alan, who is Patron of Art for Life has recently formed a committee of Academicians and willing volunteers to help him organise the event. The auction will take place in the upper rooms of the Royal Clarence Hotel in Cathedral Close, Exeter on May 11th, with Robin Barlow DL FRICS ASFAV conducting the Auction. There will be a full colour brochure with each work illustrated, together with a short biography of the Artist. If you would like to receive a catalogue please contact Alan through this website. The first Children's Hospice to be set up in the South West for the care of children with limited life expectancy was Little Bridge House Nr Barnstaple. In addition to caring for the children the hospice also provides accommodation for parents and siblings to enable the whole family to be together for precious periods of time. Now, thanks to continued fund raising, there are two more Children's Hospices in the Westcountry; Charlton Farm Nr. Bristol and Little Harbour, St Austell, Cornwall, all of them doing tremendous work and always in need of ongoing financial support. Alan Cotton will give an entertaining talk with stories about people and places he has encountered on his travels, culminating with his two trips to Tibet last year, with the explorer David Hempleman-Adams. This lecture will be given in conjunction with the South West Academy of Fine and Applied Arts and the Friends of the Royal Albert Memorial Museum. "Alan Cotton - A Sense of Place" Wednesday 2nd November at 6.30pm East Building, University of Bath. Alan was introduced by the Vice Chancellor, Glynis Breakwell and presented stories about people and places from his travels, and, with illustrations of his work, showed how his paintings were produced. Alan will be exhibiting paintings from his travels up Everest as Expedition Artist. 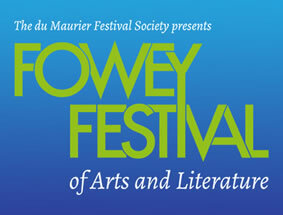 A talk by Alan Cotton called "A Painter's Journey to Everest", will take place on Sunday 20th May at 3.30pm and will form part of the Daphne du Maurier Festival held in Fowey in May 2012. 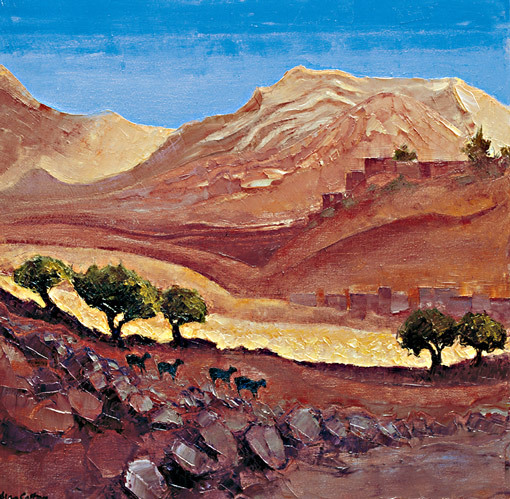 The talk will reveal not only the artist's physical journey and experiences in the Himalayas, but will explore his journey through a few earlier paintings and encounters, which led to the opportunity to fulfil a long held dream to travel to Tibet and to paint the world's highest Mountain. In May 2011 and again in October, he was Expedition Artist to Everest with the explorer David Hempleman-Adams. To book tickets contact the Box Office on 01726 879500. An exhibition of paintings from Provence, Piemonte, Venice, Ireland and Hartland in North Devon, in association with Messum's Fine Art, will open in the Lewis Elton Gallery at the University of Surrey on Monday 16th April. Alan Cotton will attend the opening Preview at 5.30pm and the evening includes a talk about his work and stories of people and places from his travels, including his recent Everest expedition. The lecture will take place at 6.30pm in the Griffiths Lecture Theatre. 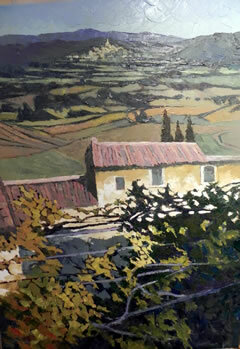 Exhibition of Paintings and Prints at Alan's Studio in Colaton Raleigh. Alan Cotton has revisited many of his favourite haunts for this London Exhibition and produced a series of new exciting work based on his drawings done on location. In addition to new paintings from Provence, Venice, Cyprus, Piemonte, Ireland and Hartland in North Devon, he has been working for the first time for many years on the Isle of Skye and has also produced a new series of Cornish paintings, Alan will be in the gallery on the opening day from midday and will be signing copies of his new book "Alan Cotton - Giving Life a Shape" By Jenny Pery. 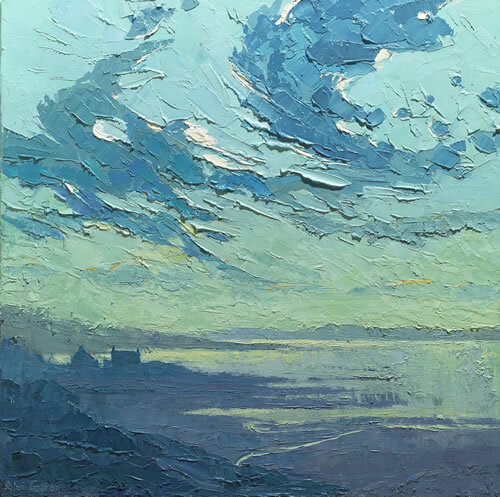 The exhibition will show that the tradition of impressionism is still strong today, and will include work by major contemporary artists who are based or have worked in Cornwall, such as Ted Dyer, Alan Cotton, Robert Jones, Andrew Tozer and Ben Warner. 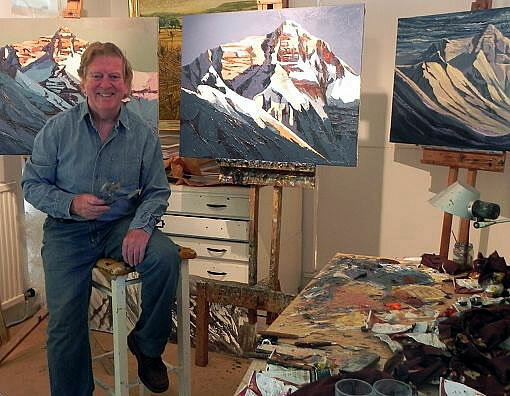 In April 2011 Alan will be travelling as the Expedition Artist to Mount Everest. He will be part of a team, lead by his friend, the explorer and adventurer, David Hempleman-Adams. They will be flying out on Wednesday 27th April and Alan is already in training, with his son Robin, who will also be going on the expedition. 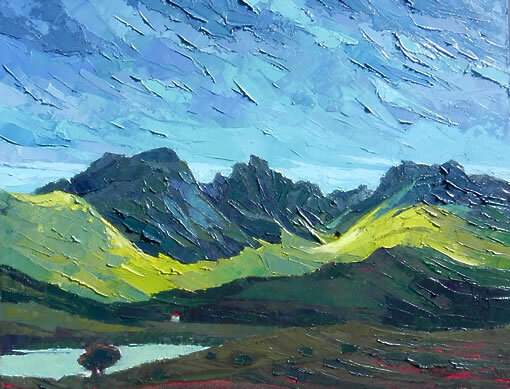 Alan says "I have always wanted to paint in high mountainous regions and for me this is a most thrilling adventure" He hopes that paintings of Everest and the surrounding landscape will be the main thrust of his London Exhibition in 2012. Alan has recently been filming with Judi Spiers for "Thinkology - Digital Creative Agency." This film can now be seen in the Multimedia section under the title "A Private Viewing". Alan's paintings were exhibited at Toronto International Art Fair 2010 Metro Toronto Convention Centre 28th October to 1st November. Alan Cotton's London exhibition opening on 15th September features over 50 new paintings, from the West Coast of Ireland, Provence and Piemonte as well as his latest work from Hartland in North Devon. Alan will be at the gallery on the Opening Day of the exhibition and will be signing copies of his new book "Alan Cotton. Giving Life a Shape" by Jenny Pery . There will be additional book signings on Thursday 16th and Saturday 18th September at 11.30 am when Alan will be giving talks about his work. "Alan Cotton. 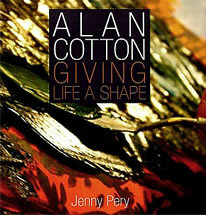 Giving Life a Shape" by Jenny Pery Published by Halsgrove. This lavishly illustrated book begins by picturing the painter working intensively for his latest exhibition. Illustrations, combined with text reveal the way in which his ideas take shape through drawing in the landscape and show how these drawings become the seed corn from which he composes the knife paintings that have made his name. For more detailed information go to the Publications page on this website. 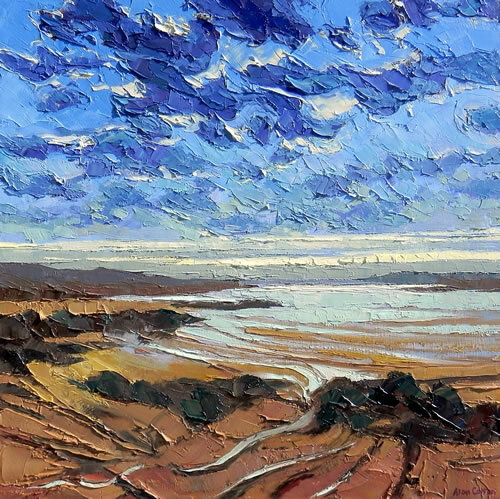 The Walker Gallery, in conjunction with Messum's Fine Art, will stage a second Exhibition of Alan Cotton's work at The Kingfisher Gallery at Sidbury Mill, near Sidmouth. For the first time here in the Westcountry Alan will be exhibiting a number of original drawings in pen and watercolour in addition to a new series of oil paintings - including paintings from Devon. There will also be a number of new paintings from his recent visit to Venice. 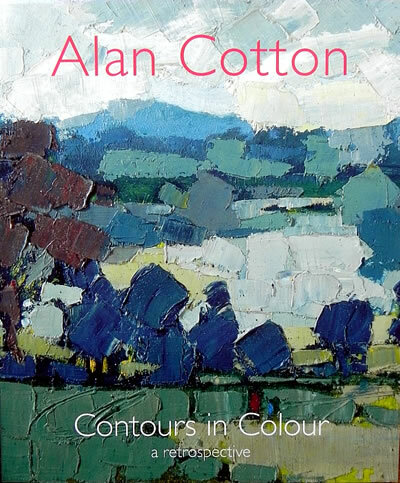 At this exhibition visitors will be able to place advanced orders for Alan's forthcoming biography - his second by Art Historian Jenny Pery - "Alan Cotton. Giving Life a Shape". This will be launched at Alan's London Exhibition in September this year. The Sidbury Mill Exhibition opens on 28th May and runs until the 6th June 2010. Alan will be exhibiting 12 paintings and 12 drawings. His paintings are based on the working drawings he does on location and, although much sought after by clients, this will be the first time his original drawings have been offered for sale. The artist will be in the gallery all day on Saturday 31st October. Alan Cotton will be exhibiting at the Toronto International Art Fair from Thursday 22nd to Monday 26th October 2009. Following the success of Alan's recent 20th Anniversary Exhibition at Messum's Fine Art in London in September/October this year, he invites you to an exhibition of paintings and Prints at his studio in Colaton Raleigh. Alan says "After a period of work for my exhibitions it is nice to share the results with others and everyone who comes to the studio will be given a warm welcome". In this show there will be work from Provence, the West Coast of Ireland and Hartland in North Devon. His entire series of Limited Edition Giclee Prints will also be available as well as two new Limited Editions to be launched at this Christmas Exhibition. Alan has donated a painting to be auctioned to raise money for the Children in Need Appeal as part of the fund raising events for BBC Radio Devon, on Judi Spiers morning show from 9am - 12 noon on the 14th November. Alan will be a guest on her programme on that morning to talk about the painting. 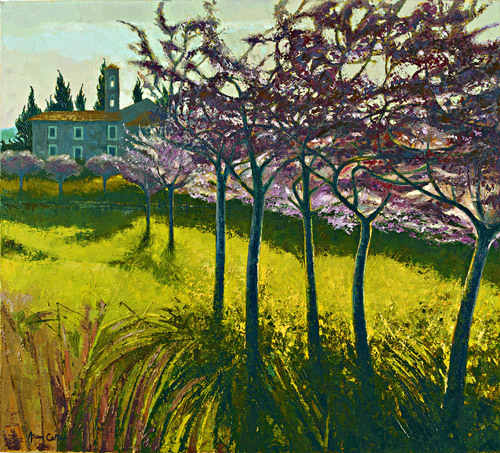 Although the painting, "Piemonte - Hillside Vines Below Diano D'Alba", in Northern Italy, would sell at his London Gallery, Messum's Fine Art in the West End, for £7,500, rarely at Charity Auctions do they reach this kind of figure, so you might obtain a real bargain and at the same time help an important cause. Anyone who paints may be interested to know that, for an auction in aid of the Duke of Edinburgh's Award Fund, Alan Cotton has donated a prize of a day working with him in his Devon studio. The visit will also include lunch with Alan and his wife Patricia. This year Alan was nominated by the explorer and adventurer David Hempleman-Adams as his icon and invited to attend the Icons' Dinners to be held at Windsor Castle on the 11th & 12th November. The bidding for a day with Alan Cotton has already started and tickets for the dinner are £1,000 each. For more details of this and to see the celebrities who will be at the dinner and those who have donated experiences or events for auction you can visit the website: www.dofe-iconsauction.co.uk. Next year to celebrate the 20th Anniversary of Alan Cotton's first exhibition in the West End of London at Messum's Fine Art, the gallery are staging the largest ever show of his paintings opening on September 17th 2008. Messum's have represented Alan Internationally since the time of their first show together. For this exhibition Alan will be painting along the West Coast of Ireland and returning to the Luberon region of Provence. A fully illustrated publication about the exhibition will be available in August from Messum's Fine Art, 8 Cork Street, W1X 1PB. The Maynard School Celebration of Art Exhibition 11th April. An Exciting exhibition by contemporary international and national artists held at the Maynard School, Exeter to raise money for an art bursary. West Hill School P.T.F.A Art Exhibition, an Exhibition of Artists based in the West Country on 18th April. East Devon Artists for Charity at Seaton Town Hall Art Exhibition in Aid of Force, The Exeter based Cancer Charity. 23rd May. Seaton Art Society Summer Exhibition. Opening on 1st August. Tiverton Art Exhibition 8th August. Teignmouth Art Society Exhibition 13th August. Budleigh Salterton Art Club 15th August. 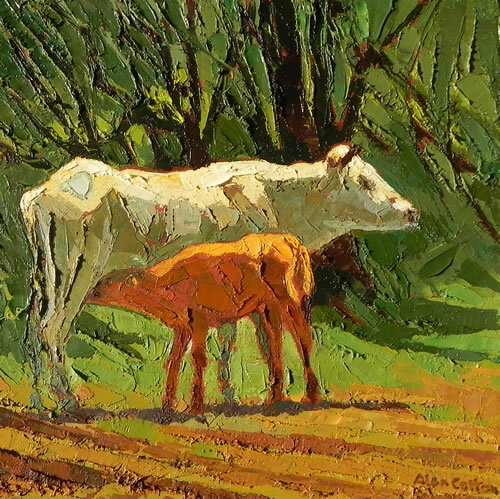 Alan Cotton's December exhibitions at his Studio at Colaton Raleigh have been enjoyed for many years and once again he is opening his doors from Saturday 1st - 4th December. Everyone who visits the exhibition will be given a warm welcome where they can enjoy a glass of wine or a coffee in a relaxed atmosphere and have an opportunity to meet the artist. This new collection of paintings at his studio gives a South West audience a chance to see where the artist works and view a selection of his images from the West coast of Ireland, Venice, Piemonte and Hartland on the North Coast of Devon. This year a new 45 minute film was made about Alan's work, both on location and in his studio. The artist is seen working on a large canvas from the first mark to the completed painting. The film will be shown throughout the exhibition and will be available on DVD. In the exhibition in addition to the paintings there will also be a number of Limited edition prints available. Signed copies of Alan's biography "On A Knife Edge" by Jenny Pery, published by Halsgrove, will also be for sale at the exhibition, together with many of the fully illustrated publications of his past London exhibitions. Alan's work has found its way into many important collections, including the Royal Collection. Two years ago he travelled to Sri Lanka, Australia, New Zealand and Fiji when he was invited by His Royal Highness, The Prince of Wales to accompany him as Tour Artist. He has carried out a number of public commissions including a series commissioned by Cunard for the new Queen Mary II. Other Commissions include a painting of the Tamar Bridge for Carlton Television and a large painting of the Exe Estuary for the Royal Marine Camp at Lympstone. Currently he is working on a series of five large Venice paintings for a private collection in Miami. There have been a number of television programmes about his work, shown on both BBC and ITV, and as a presenter or writer, he has been involved in many films for BBC and also with Carlton Westcountry ITV. Alan has done much to support and promote the Arts in the South West, particularly working with children, students and disabled painters and through his work has supported many charitable organisations. He is Patron and President of a number of art societies and for many years was a Director of the Exeter Phoenix Arts Centre. He was a founder member, and until recently the President, of the South West Academy of Fine and Applied Arts. Last year the University of Exeter awarded Alan an Honorary Doctorate (D.Litt) for his `Outstanding contribution to the arts'. Alan was delighted because previous recipients of this award include Barbara Hepworth, Bridget Riley and his friend the late Terry Frost. Alan Cotton's next exhibition "Return to Hartland" will be at the Walker Galleries, which have recently re-located to Sidbury Mill, near Sidmouth, Devon. The exhibition opens on Saturday 8th September and runs until Sunday 23rd. A major scale exhibition of paintings from Australia, New Zealand, Fiji and Sri Lanka (From Alan’s recent tour with HRH The Prince of Wales) plus other new paintings from Piemonte in Northern Italy and from Donegal, Connemara and Co. Kerry on the West Coast of Ireland.